If you are new to the game, get checked by a health professional, such as a chiropractor, to make sure it’s an appropriate fitness activity for you. If you are a regular player, routine chiropractic check ups can help optimize your muscle and joint function and deal with stiffness and soreness before they sideline you. Never stretch a cold muscle. Always warm up before pre-game stretches. Lay on your back and bend one knee towards the ceiling. Hold the back of the thigh with both hands and straighten the knee as much as you can by raising your foot towards the ceiling. Hold the stretch for one second, then bend the knee and straighten again. Repeat 20 times on each side. Stand with your feet shoulder width apart. 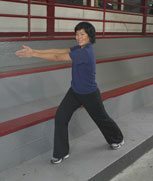 Step forward with your right foot into a lunge position. Your right knee should be directly over the toes of your right foot. Keep your left leg and your back straight. Extend your arms straight in front of you and bring your palms together. Turn your upper torso to the right, keeping pelvis and hips stationary. Hold for one second and repeat 10 times on each side. If you are injured during practice or a game, don’t try to play through it. Put ice on the injured area for periods of 15-20 minutes. If you think you suffered a concussion, have neck or back pain, or experience tingling or numbness, get examined by a healthcare professional immediately. Stand with your back to a wall or the rink boards. Kneel onto your right knee (use a pad for cushioning) with your right foot flat against a wall. Your left knee should be bent in front of you at a 90-degree angle for support. Place your hand on your left knee for balance and lean back slightly to stretch your right quad muscle. Hold the stretch for ten seconds. Switch legs and do three stretches on each side. 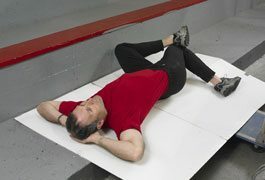 Lay on your back with your knees bent and feet flat apart on the floor slightly more than shoulder width apart. Lower your right knee to the floor and place your left ankle on top of it pushing the knee towards the ground. Keep your hips on the floor. Hold the stretch for 10 seconds. Switch sides and do three stretches on each side.